Cats shed — it's a fact. 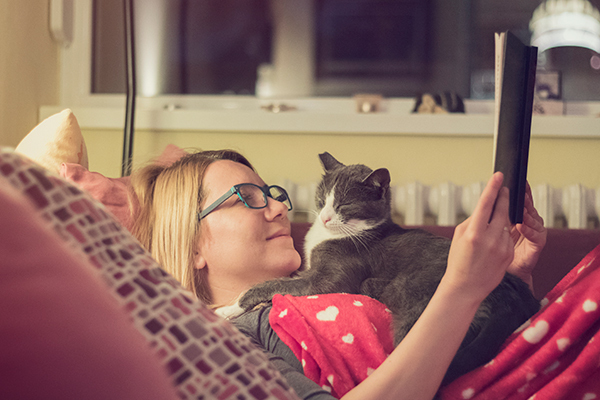 Accept it, then consider these ways to contain cat hair the best you can. You’re standing in line at the airport, waiting to check your luggage, and a well-dressed woman says to you, “I can see you have pets.” When this happened to me, I quickly looked over my clothes to make sure I wasn’t covered in cat hair. But she pointed to my canvas suitcase, which had a layer of cat hair to it. First, what are all those cat hairs? Long-haired cats have awn hairs in abundance. Photography by aspen rock / Shutterstock. Guard hairs: These are from the topcoat that protects cats from rain or snow; Abyssinians and Domestic Shorthairs have mostly these types of hairs. Awn hairs: This soft, fuzzy belly hair that keeps cats warm and provides insulation; Persians and many long-haired cats have this in abundance, not just on their bellies. Down hair: These dense, very short hairs close to the skin protect it from abrasion; only triple-coated cats, such as Siberians and Norwegian Forest Cats, have this type of hair. Let’s face it. Cat hair is everywhere. So here are some things to help you deal with it. For cats, shedding is “a normal process of hair growth and replacement,” says Dr. Jane Brunt, a vet who founded the Cat Hospital of Towson in Baltimore and served as past president of the American Association of Feline Practitioners. 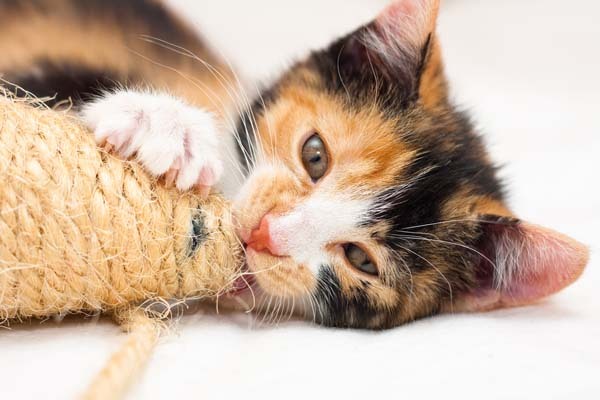 Unlike with humans and certain dog breeds, cat hair grows to a fixed length, dies, and falls out as it’s replaced by a new hair, explains Dr. Gary D. Norsworthy, board-certified feline specialist and owner of the Alamo Feline Health Center in San Antonio. “That is why cats do not need regular haircuts,” he said. Cats who go outdoors shed more in the spring, and new hair growth will accelerate in the fall and winter. “However, about 80 percent of my patients literally never go outdoors, so they are not as aware of seasons. This means there is not a significant difference in seasonal shedding in indoor-only cats,” Norsworthy said. Stress, parasites such as fleas, a poor diet and certain diseases can cause cats to shed more than normal. Because of this, don’t assume that an excessive amount of hair loss is a skin or coat issue, Brunt says. Arthritis and obesity can cause a cat to be unable to groom normally, which might cause coat abnormalities. Food allergies can cause itchiness, excessive grooming, and hair loss. “This can be a bigger problem than a normal shed cycle or grooming issue, so absolutely get your veterinarian involved,” she said. or dehydrated cat would show it in a dull coat, excessive hair loss, matted hair, dandruff or an excessively oily coat. Skin is the body’s largest organ, Brunt explained. 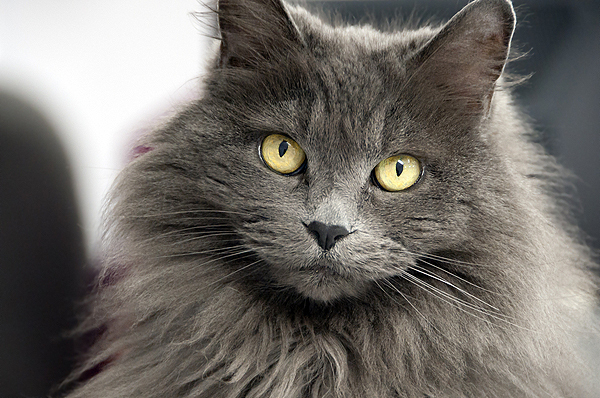 If your cat eats a healthy diet and drinks enough water, you will see it in her gorgeous coat. A normal, healthy cat takes in the amount of water she needs. Cats need a high-protein, low-carbohydrate diet. “These diets generally result in much more luxurious hair coats with less shedding,” Norsworthy says. “Food allergies can show up as skin and hair-coat problems,” Brunt explains. Cats can develop an allergy to a protein source, in which case you will need to feed a low-allergenic diet that uses a protein your cat has never eaten before. Normal petting is enough to remove shedding hair for some cats. Joan Miller, Cat Fanciers’ Association chair of outreach and education and all-breed judge emeritus, grooms cats by petting. The former Abyssinian breeder dribbles a little room-temperature bottled water into her hand and pets the cat’s coat until dry. “I never used a comb or brush on my Abys,” she said. Dead hair comes off of the cat’s coat during petting, Miller said. Miller also recommends wet-hand petting for Orientals, Domestic Shorthairs, Tonkinese and other cats with mostly guard-hair coats. 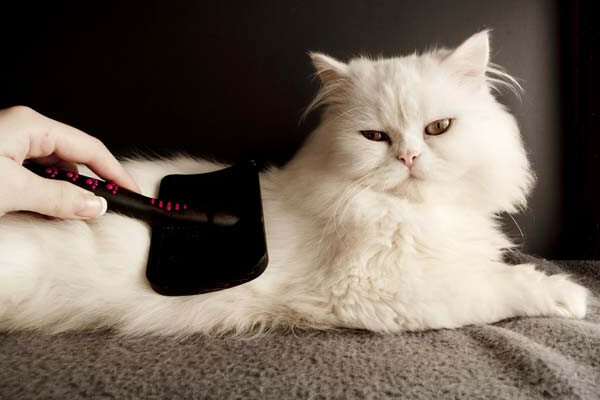 Persians and other long-haired cats, on the other hand, have an abundance of awn hairs and need to be brushed daily. 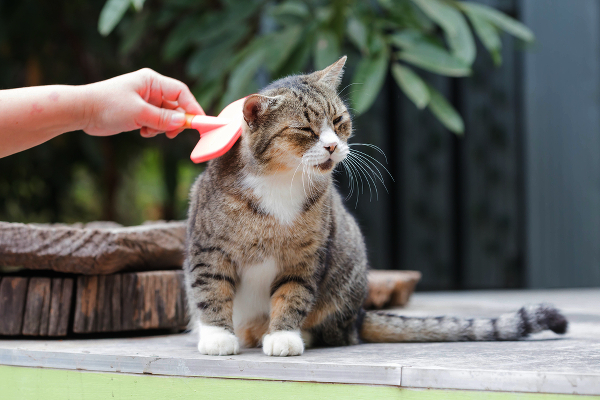 Brush your cat regularly to keep cat hair under control. Photography by Chayut Thanaponchoochoung / Shutterstock. a brush your cat likes is key. Our cats let us know when it’s time to brush them, because they go to that same spot at the same time each day, give us that look, and meow until we brush them. My husband and I have noticed that they don’t shed as much as they did before we brushed them every day. We also find fewer hairs around the house. “Long-haired cats with an abundance of awn hair, like Persians, and other breeds generally need to be combed every day with a good stainless-steel, long-tooth comb that will go to the skin,” Miller says. The very fine, soft belly hair can be groomed with a slicker brush. 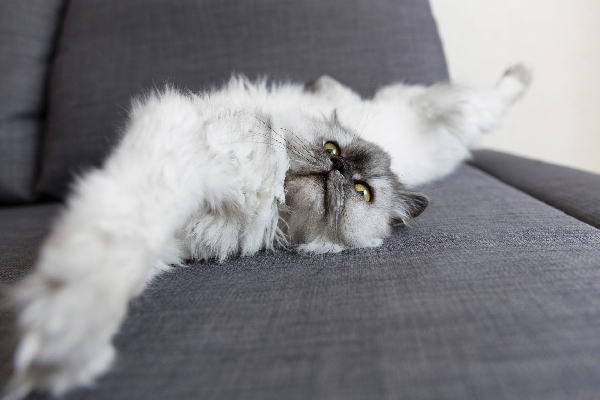 If long-haired cats are not groomed regularly, they will develop mats, especially in the front armpits and in the belly area, and they will shed hair that sticks to furniture and clothes, Miller said. “I like flea combs, slicker brushes, and Furminator-type brushes,” Brunt says. Never attempt to cut out your cat’s mats if you can’t comb them out, Brunt warned. “Please see a vet or groomer to comb or clip them out, because their skin is so elastic,” she said. essential to managing cat hair. Many manufacturers design their vacuums with pet hair and allergens in mind. You’ll want one with a HEPA filter to reduce allergens and one that excels at picking up pet hair. Vacuum the main living area weekly, and use the attachments to go over furniture, window treatments, and car seats as needed. My husband even vacuums the cat trees on occasion. Go over wood, laminate or tile flooring with an electrostatic or microfiber dry mop. Reach into corners where cat hair collects. Also use an electrostatic or microfiber cloth on any non-upholstered furniture. go over cloth surfaces just before entertaining. I’m not kidding. Several of our Facebook fans suggest this. Several other Facebook fans reported collecting their cats’ hair for the same purpose; some identified it as a great idea. Who knew? Use a lint roller on your clothing before going out and before washing your clothes. Get rid of as much cat hair as possible before sticking clothes in the wash, or you will end up with thousands of cat-hair beads stuck to clothing and in the washing machine. If your clothes are covered in cat hair and it would take hundreds of lint roller sheets to de-fur them, you can put your clothes in the dryer for 10 minutes with a dryer sheet. The cat hair will end up in the dryer’s lint catcher. Just kidding. Seriously, though, if someone says something to you about being covered in cat hair, you could just wear it with pride as one Facebook fan suggests. Thumbnail: Photography by DreamBig / Shutterstock. About the author: Susan Logan-McCracken and her husband are brushing their two cats, Sophie and Maddie, more regularly now that they have found a brush that their kitties love. Their Southern California home has less cat hair floating around in it now. April is Spring Cleaning month here at Catster! 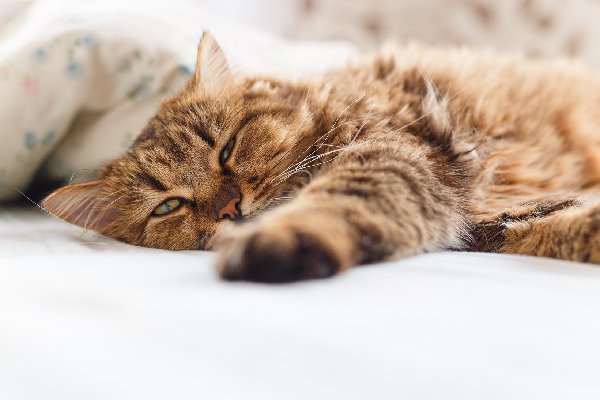 Stay tuned for a few articles every week on all things spring cleaning and cats — whether that’s cat-safe ways to clean your home, spring-cleaning your cat’s grooming routine with advice on brushing and bathing — and much more. Is Shaving Your Cat Okay? I, too, had a lab. and his hair managed to find its way everywhere, but I introduced him to the vacuum cleaner, Firstly I got him to sit with me, with the cleaner the other side of me. Switched off, I may add. Then I switched the cleaner on while still stroking my dog with my other hand. Then made a game of it and gradually he used to let me hoover him with the attachment. In a short period of time, whenever he saw the hoover he would wait to be hoovered. I think he loved the sensation. I clean houses, professionally. And because I publicize that I love cats, almost all of my customers have cats! I have had to be in genious about ways to get rid of kitty fur. One thing that really works for me are small foam sponges Dollar Tree sells for washing dishes (they do that well, too! Cost is low: $1 for 6 of them.) I found that if I rub one of these sponges over fabric, like on furniture? Cat hairs come off at a rather alarming rate. LOL! Sticky sheets are okay but cost too much for many people and they dont always get the job done. I use a vacuum cleaner (made by Shark) that has a super bright headlight. The first time I used one in my own home, I was shocked to see how much kitty litter, cat fur and other weird stuff was actually on my tile floors. Holy cow! Talk about an eye opener. Now, I would never use a different sort of vacuum ever again. Baby steps. Start with a section she likes and do a little more each time until she let’s you do all of her. She might have a short attention span. I only get parts of my long-haired done at any given time, and of course, he doesn’t want to cooperate when I initiate. But I keep the comb next to my chair and when he wants to sit on my lap, I can get some done. He especially wants to be brushed if anyone else is being brushed and especially if the dog is getting attention. So – when he mats, I take him to the vet for a brush-out. What can I say? He rules. Make sure the brush you are using is not pulling the hair to the point of discomfort for your baby. I use either Gerber Stage 2 baby food in Ham, Chicken, or Turkey OR Tiki Cat Mousse Cat Food (Petco or Amazon) as a treat after a brush or two. A couple of bites, then more brushes…a couple of bites, then more brushes….etc., even my boy that hated brushing will let me do it now and wait for his treats after I finish…it takes patience…but they will eventually settle down…I use a furminator type brush because it does pull out the undercoat…my Theodore (Siamese) loves to be brushed now, in fact, when I walk over to the chair where the brush is on the side table he is the first one in line!!!! Susan,this is the glove on Amazon – Pet Grooming Glove – Enhanced Five Finger Design – For Cats, Dogs and Horses – Long & Short Fur – Gentle De-Shedding Brush – Your Pet Will Love It ! It’s 12.99. I have a long hair kitty,who loves being petted/ brushed with the blue glove for grooming cats. It’s the one that you “peel” the hair off each time .I have combed/brushed through two of them and given them to friends for their cats.Cost approx 18.00 and worth twice that much! Try brushing when giving your cat a desired treat. I had to resort to that with our longer haired lady. She HATED it at first, but when paired with a yummy treat, she tolerated it in increased increments over time. I tell her it’s time for ‘Beauty Shop’ and what a pretty girl she is as I comb her. I decided that getting a little fur every day or so is better than none at all. I love the articles and helpful tips! My very loving, long haired cat hates to be brushed! But I keep trying. I’ve tried different kinds of brushes to no avail. I’ve talked softly, petted and even sung while brushing :). She will tolerate it for a few moments, then gets mad and swats at the brush or hisses at me! What am I doing wrong?